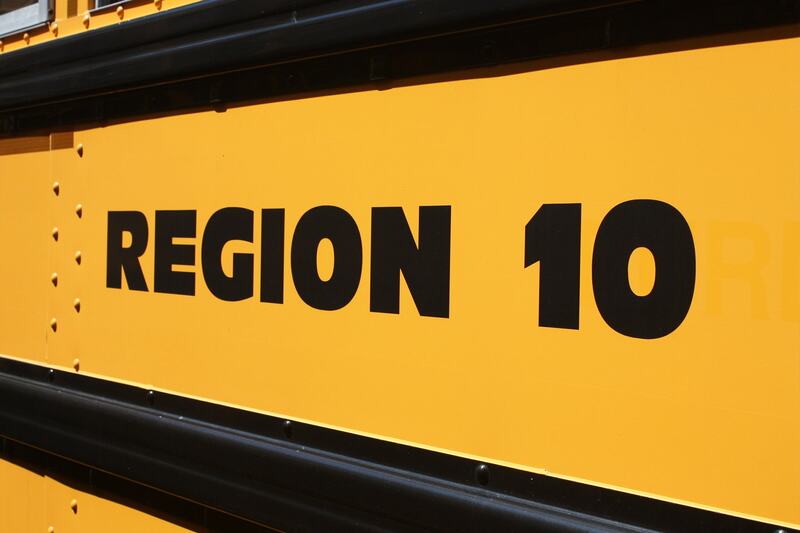 The school bus routes for the Region 10 Schools are listed under the school that your student will be attending. You can find bus routes here. Residents are asked to share issues or concerns with their child’s bus stop location by calling All-Star Transportation’s Harwinton office at 860-605-9285. Parents should check the district website for information about early dismissal days (for example: conferences and early release days). You can find a complete list of school bell schedules listed below. For kindergarten students who will be riding their first bus, there’s an orientation video available. NOTE: Bus schedules are subject to revisions that result from enrollment changes, transfers and address changes. Changes and/or additions will be posted to the school district’s website and residents are encouraged to frequently check the Region 10 website. Please do not worry if a bus is late, especially at the start of a school year when it typically takes a few days for kindergarten children and new students to become accustomed to the bus routes and schedules. If, however, you have concerns about your bus being consistently late over a period of several days, please contact the Harwinton office at 860-605-9285. If there is a 90-minute delay to school opening, there is no morning Pre-K. There is, however, afternoon Pre-K at the regular time – 12:45 p.m. If there is an early dismissal due to inclement weather, there is no afternoon Pre-K. Dismissal for the morning Pre-K is 1 p.m. and lunch will be provided to students transported by bus. Parents who transport their children need to pick them up at the regular time. Region 10 transportation procedures for inclement weather for out-of-district schools can be found here. If Region 10 is closed, no transportation will be provided to out-of-district schools. If there is a 90-minute delay to the opening of Region 10 schools, out-of-district buses will be 90 minutes later than normal. If Region 10 schools dismiss early due to inclement weather, Region 10 will contact out-of-district schools to arrange transportation. Lewis Mills High School – 8:55 a.m.
Har-Bur Middle School – 9:35 a.m.
Harwinton Consolidate School – 10:35 a.m.
Lake Garda School – 10:35 a.m.
Lewis Mills High School – 11:00 a.m.
Har-Bur Middle School – 11:45 a.m.
Harwinton Consolidate School – 12:30 p.m.
Lake Garda School – 12:30 p.m. In the morning, students arrive at Lewis Mills High School on their regular school bus and then are taken to Bristol Satellite by shuttle bus. In the afternoon, students are shuttled back to Lewis Mills where they board their regular buses for home. If a Region 10 student wants to be dropped off at another stop, a parent or guardian must call All-Star’s Harwinton office at 860-605-9285 and provide the driver with a note. If the requested stop is not a designated stop the parent or guardian must call the Region 10 business office (860-673-2538, Ext. 10139) for permission. All-Star does not allow out-of-town students on its buses, even if traveling with a friend who is a Region 10 student. In the event the superintendent closes Region 10 Schools due to unsafe road conditions, NO bus transportation will be available if Bristol Technical decides to open or delay opening. Likewise, should Region 10 Schools go to a delayed opening due to questionable road conditions, scheduled bus service will be on a 90-minute delay, even if Bristol Technical opens on a regular schedule. In the morning, students are picked up at their designated stops by All-Star Transportation and brought to Oliver Wolcott. In the afternoon, students are be picked up at Oliver Wolcott High School by All-Star Transportation and brought to their designated stops. If a Region 10 student wants to be dropped off at another stop, a parent or guardian must call All-Star’s Harwinton office at 860-605-9285 and provide the driver with a note. If the requested stop is not a designated stop the parent or guardian must call the Region 10 business office (860-673-2538, Ext. 10139) for permission. All-Star does not allow out-of-town students on its buses, even if traveling with a friend who is a Region 10 student. In the event the superintendent closes Region 10 Schools due to unsafe road conditions, NO bus transportation will be available if Oliver Wolcott decides to open or delay opening. Likewise, should Region 10 Schools go to a delayed opening due to questionable road conditions, scheduled bus service will be on a 90-minute delay, even if Oliver Wolcott opens on a regular schedule. In the morning, students will be picked up at their designated stops by All-Star Transportation and brought to Wamogo High School. In the afternoon, students will be picked up at Wamogo High School by All-Star Transportation and brought to their designated stops. If a Region 10 student wants to be dropped off at another stop, a parent or guardian must call All-Star’s Harwinton office at 860-605-9285 and provide the driver with a note. If the requested stop is not a designated stop the parent or guardian must call the Region 10 business office (860-673-2538, Ext. 10139) for permission. All-Star does not allow out-of-town students on its buses, even if traveling with a friend who is a Region 10 student. In the event the superintendent closes Region 10 Schools due to unsafe road conditions, NO bus transportation will be available if Wamogo decides to open or delay opening. Likewise, should Region 10 Schools go to a delayed opening due to questionable road conditions, scheduled bus service will be on a 2-hour delay, even if Wamogo opens on a regular schedule. Region 10 has an established procedure for changing bus drop offs and pickups. If you need to change the location where your student is picked up or dropped off, you must do so through your school’s main office or from Region 10’s business office. The process outlined in Region 10’s Transportation Packet. Students in kindergarten through second grade must be met at the bus stop by a parent, known adult or older sibling. If no parent, known adult or older sibling is at the bus stop, children will be transported back to their home schools. If a family chooses, a waiver may be signed that will allow a first- or second-grade child to disembark from the bus, even if no adult is there to meet the children. Please check with your child’s school for the procedure. No waiver will be accepted for a kindergarten student – an adult or older sibling must always be present. If you have questions, please e-mail [email protected] or call All-Star Transportation at 860-605-9285. Bus routes and stops are developed taking into consideration safety and efficiency. To this end, the Region 10 Board of Education may accommodate one permanent Monday through Friday pick-up and drop-off schedule for each child per school year provided it is along established bus routes. In the event of a permanent change to a pick-up and drop-off schedule is needed during a school year, a written request must be submitted to the school principal at least three weeks in advance of such a change. The school bus is an extension of the classroom and students are expected to maintain behavior acceptable in a classroom setting. The Board of Education has established regulations guiding conduct on a school bus, which you can read here. 8. No student should ever run towards/from the rear, alongside of a bus. A driver may not see a student in some danger zone blind spots. 14. No smoking, including electronic cigarettes/vaping. 15. Do not destroy bus equipment/fixtures. If you have any questions, please contact All-Star Transportation’s Harwinton office at 860-605-9285.